December 6, 1978 –Henry Moore visits Rolling Meadows to approve the location for “Large Two Forms,” a work he completed in 1969, one of four casts of the work. The sculpture, 17 feet 6 inches at its highest point, will be located atop a specially constructed mound at Gould Center, the corporate headquarters of Gould, Inc., an electronics firm that no longer exists. To make way for the sculpture a sculpture by Pablo Picasso and Carl Nesjar, known as “the Bather,” was moved. Moore says, “I am very happy. You can see the piece against one of the best background you can have for sculpture – the sky.” [Chicago Tribune, December 7, 1978] He adds that he had “nothing to do” with the move of the Picasso. When Gould, Inc. was purchased by Nippon Mining Co. Ltd. Of Tokyo in August of 1989, the corporate headquarters moved to Eastlake, Ohio. Both the Picasso piece and “Large Two Forms” were bought by a private developer. 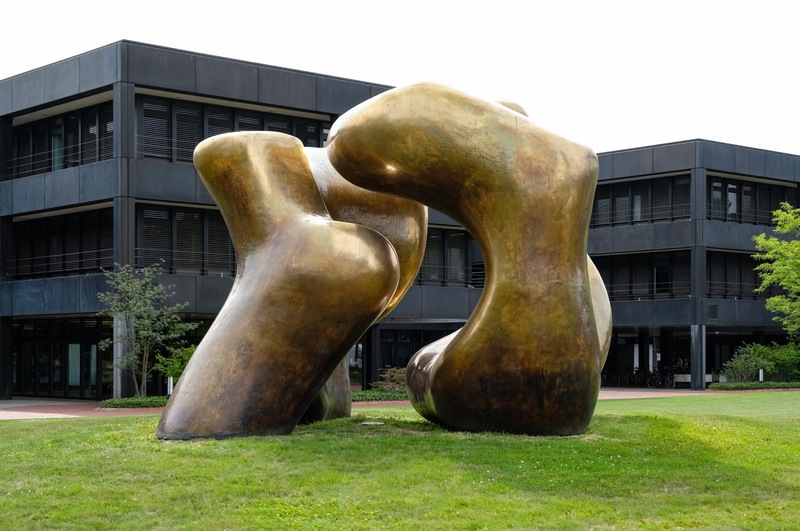 I am not completely sure of this, but it appears that the large sculpture is today displayed in Bonn. December 6, 1953 – The Chicago Daily Tribune runs the fourth in a series of articles discussing the “origin, history and significance of some of Chicago’s principal thorofares.” [Chicago Daily Tribune, December 6, 1953], and some interesting tidbits turn up. Wells Street, for example, was named after Billy Wells who was raised by the Miami Indians and died in the 1812 massacre near Fort Dearborn. It became such a tawdry byway that the section of Wells south of the river was changed to Fifth Avenue in 1870, the name it carried until 1918 when the name was changed back to Wells Street. The first jail in Chicago was on LaSalle Street on the southeast corner of Randolph Street. The last bear that was shot within the corporate limits of the city was killed at the corner of LaSalle and Adams on October 6, 1834. LaSalle Street also had the city’s first bank, the Illinois State Bank, which was chartered on December 5, 1835. At the corner of LaSalle Street and Washington Boulevard the first courthouse was built in 1837. Just before the Chicago fire in 1871 the first tunnel beneath the river was finished on LaSalle, a bore that could carry “50,000 vehicles and 1,000,000 pedestrians” each day. The tunnel served as the only passage between the north and south sections of the city for three months after the fire destroyed all of the bridges downtown. Clark Street may possibly be the oldest street in the city, the result of an old trail from the south. “Clark Street,” the Tribune repored, “early became known as a street of contrasts, alternating fine residences and substantial businesses with shanties and dives, and that character seems to cling to it.” Chicago’s first newspaper, the Chicago Democrat, was published at the corner of Clark Street and Water Street. It was in a cigar store on South Clark Street that Bathhouse John Coughlin and Hinky Dink Kenna held forth, the place “where they swapped handouts to the impoverished for votes.” At the turn of the century a section of Halsted Street was populated by Italian immigrants, “crowded into lodging houses which advertised rates of ’20 cents a day, bath and two meals included.’” Clark Street angles off to the west just north of North Avenue, eventually connecting with Ridge Road and the Green Bay trail, making it a street that from the beginning of the city’s history leads into the city from the south and north. Any connection on Clark Street between the south and the north sections of the city has long since disappeared, but for a long time the street followed Rush Street to Chicago Avenue where it turned to the northwest for about a mile to the junction with North Avenue. The above sketch shows the city, looking south, in 1888. December 6, 1892 – In the wake of the United States Supreme Court deciding for the State of Illinois and Chicago in its suit against the Illinois Central Railroad over the right to submerged lands, the Chicago Daily Tribune tempers elation with a warning: “This decision does not give the Lake-Front to the city for Aldermen to speculate with and enrich themselves. It is given to the city for ‘public uses’ . . . The land south of Monroe street, including that which may be reclaimed from the water between the government dock line and the shore, should be converted into a beautiful park. There should be no building there except the Art Institute which is now erecting . . . Boodle Aldermen must keep their hands off. 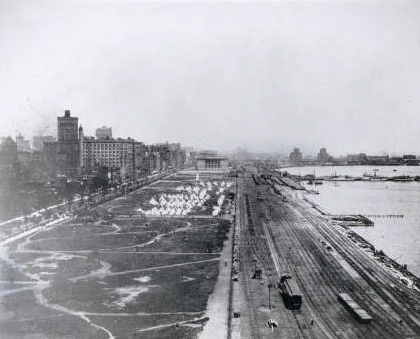 They must not be allowed to make private profit out of this property of the people, the use of which they have been deprived of for nearly a quarter of a century, but which has been saved to them.” [Chicago Daily Tribune, December 6, 1892] The above photo shows the Lake-Front park two years later, a year after the Art Institute was completed.